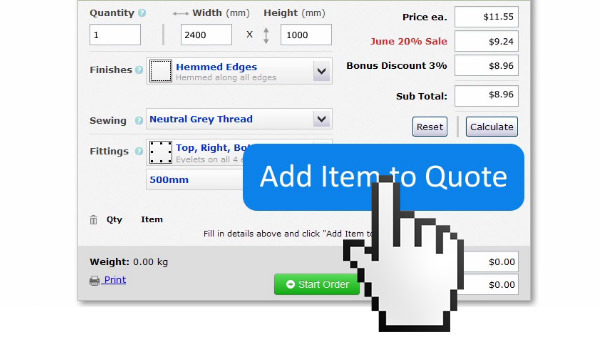 Within a few steps you can manage all your wholesale Prices, Sizes, Options, Discounts, Orders and Track all features. Your payment is held in protection for up-to 10 days before being released from a neutral bank account. We hold the funds in a third party bank account until the client has approved the completed work and authorized us to pay the factory. On the website, you can use the Quote & Upload Calculator. 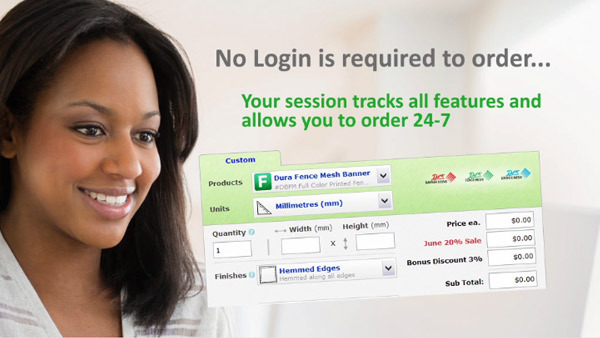 Your session tracks all features and allows you to order 24 hours a day 7 days a week. The calculator gives you choices and options by choosing the drop down fields. 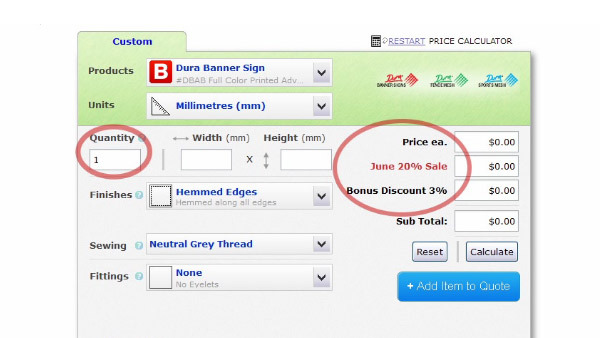 As you modify the options, Quantity discounts, Bonus discounts and any Storewide discounts are applied. The price changes always showing you the lowest discount price. 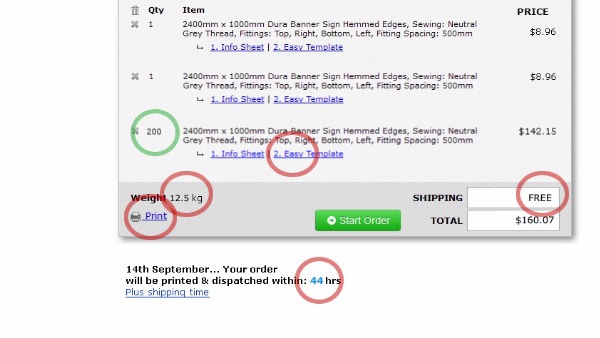 Fill out your quantity, width and height... then move through the fields and choose the details of your order. 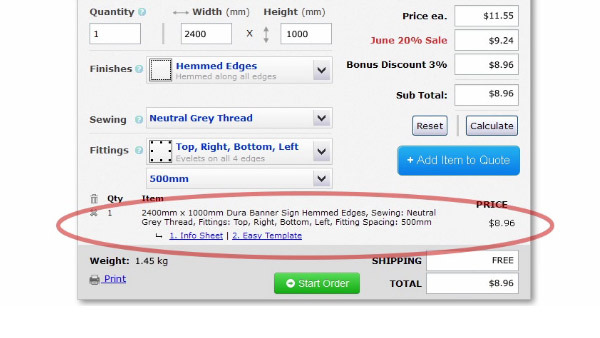 You can choose materials, inches or millimetres, fitting options and more to customize each item. The calculator works by adding a LINE ITEM suited for each artwork design. (in the same manner as a shopping cart would do so). 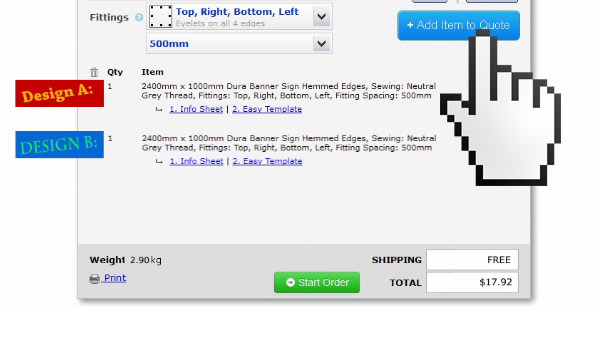 Click the "Add Item to Quote" button. 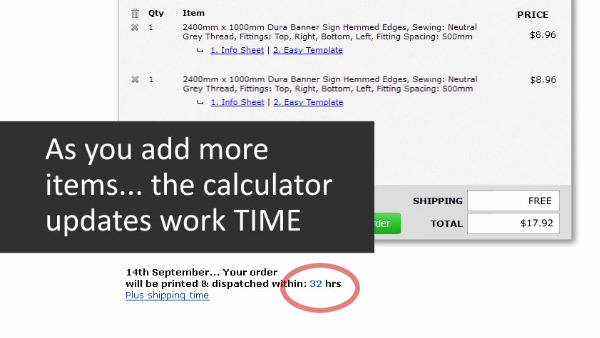 A line item will be added to your calculator and your total will appear below. A line item is stored. You can click Start Order... OR.... add more line items to the same quote. 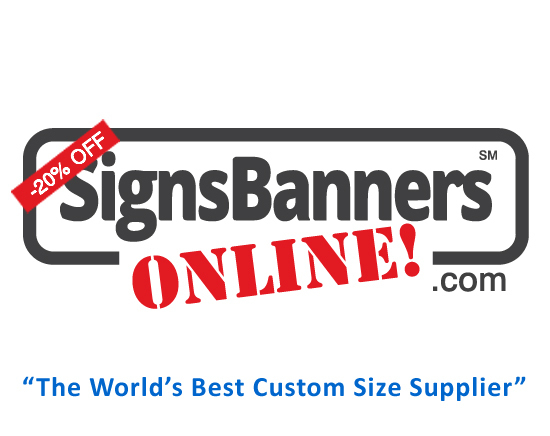 Remember, if you have the same size banner, BUT a different design... you will need to add another LINE ITEM by clicking "Add Item to Quote" so that when it's time to upload, we know you have two items of the same size, but different artwork designs that you can upload for each line item. 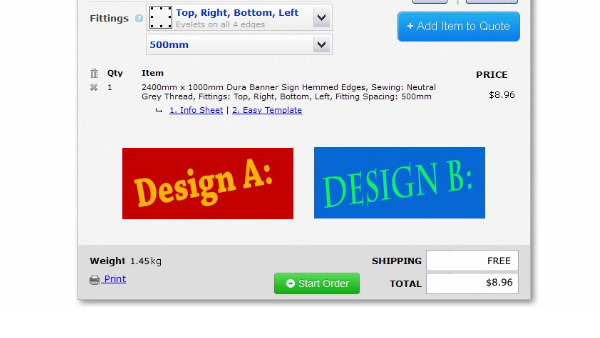 Print Estimate, Weights, Info Sheets, Easy Templates and more. See the weight of your items. Generate an Info Sheet or Easy Template for you or another designer. View if FREE SHIPPING or if 'Some Shipping Applies'. 2. Fill in your Shipping Label details. 3. The Upload Summary appears allowing you match your artwork designs with your order. 4. Upload your files, approve and pay. Your order will begin.